Living at Stayton Acres has been a dream for us. Not only have I learned how to wash a horse, we have had a slow and much needed education in RV life and how things can go wrong. 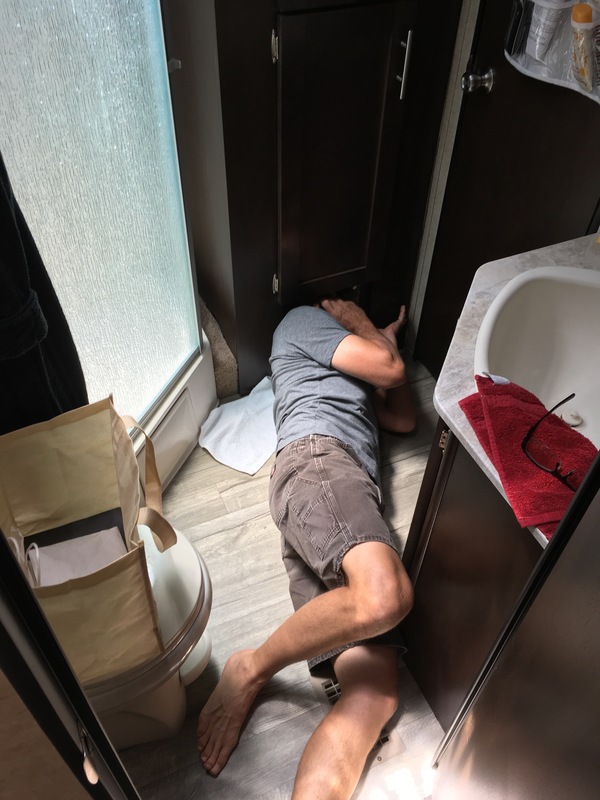 After a very rocky start to our “RV Career” we grew to expect that we would be fixing problems every single trip and that pushed us to plan ahead on our time and finances. It has been TRUE. Something has gone awry every single trip! Now we anticipate it and it isn’t painful or frustrating. This is our 5th day here in Santa Rosa California. It’s a farm along with a citrus and avocado grove. Missy asked us today, “Have you gone out to pick your breakfast yet?” It’s nuts and awesome and we are so grateful. Last night I felt like we were in a dream. A little hiccup happened on Day 2. We are hooked up (dry camping) to power and water. We have access to a full bathroom and shower just a few yards away. Shower’s in the Lorax are completely cool but full blast plumbing and long hair are just dreamy. The water hose is hooked up well. We turned off the pump because it isn’t needed. We discovered today that our pump regulator plug is defective. At 3:45am (we wake up early enough to get the pets all handled and have some coffee) Randy walked into our 2 x 2 foot restroom only to find it had flooded! “The top linen closet, on the right side at the bottom of the stack of towels.” We saved ONE large junk towel to wash the dogs with and donated the other twenty we had collected over the decade at Monticello House. I hear rummaging around and held my breath to listen for the sound of the towel being pulled out. It never came. SIDEBAR: Over the last decade we have had a bit of a crisis with me caring too much about what a towel is used for. I do not dig cross contaminated towels. The face towels must not EVER be used for bodies and never EVER use a cleaning rag to wash dishes. If I find you used my dish drying towel for anything OTHER THAN drying a clean freshly washed dish I will lose my mind. I just cannot get full buy off by my husband to stop doing it. When I am drying a dish and a brown hair appears I now show him immediately. It’s useless though. “Go ahead” I say and wait for him to ask me to help do something to remedy the situation. He doesn’t so I snuggle deeper into my covers and pillow. 10 minutes later (and I am supposed to be up by now but I’m not) he tells me the pump is leaking, again. This is the second time it has happened and we have to figure it out. He turns off the pump, the water is swabbed up and he turns off the water at the main house then takes off to camp. I stay home to write (which was the plan) and now keep an eye on the water situation. That was 4:40am. 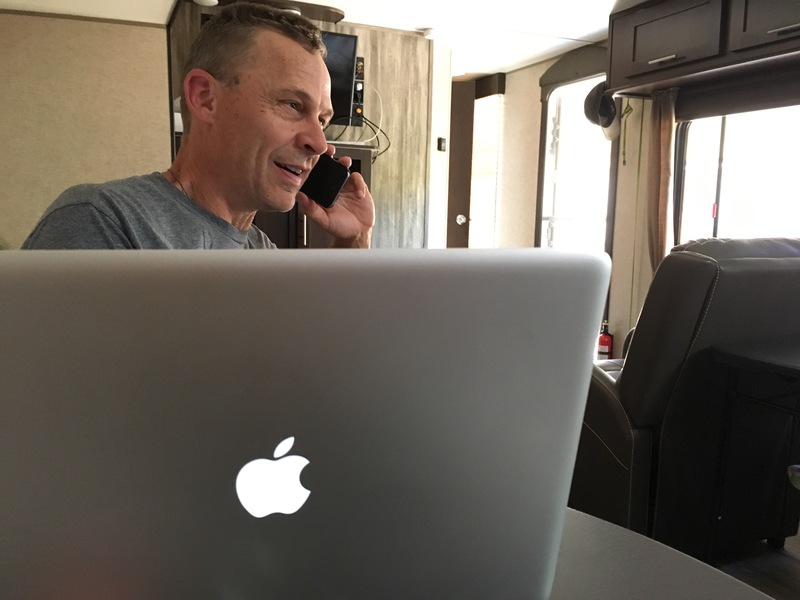 At 8:30am he returns with a plan to drive to Conejo RV and talk to Mike. Mike is, by far, one of the greatest RV repair men ever. His advice is direct and there is a line out the door of people getting his help, repairs and/or modifications to their rigs. Shurflo gave us excellent service. After a quick breakfast and attempts to contact CoachNet, the manufacturer of the Water Pump as well as Forest River (our RV manufacturer) he sets off into town. Not even an hour later he returns with the conclusion that our pump is defective! We have two options: tow it to Upland to the RV Spa where we purchased it to have it serviced or buy a pump for about $150 and replace it. Our experience at The RV Spa was not that great and we’re pretty darn sure they could care less that we’re having any difficulties. For the record: I would not recommend a new RV’er use them for ANYTHING. They are all about getting the rig off the lot and you assuming the responsibilities. No friendly check up, no inquiring about how things are going…NOTHING. They also try to sell you things you really, honestly, sincerely do not need (like warranties). We got a different shower head and toilet based off of their scare tactics. We did NOT buy their warranty after taking the time to fully read every single word out loud to each other. He chose to buy a new pump and replace it. It was critical that he record how to take it apart and put it back together and he set the space up fully to work. The pump manufacturer was awesome too. They are sending us a brand new pump, no charge! We’ll post the video of the process just in case you happen to need help on this topic. So, the shitter technically wasn’t broken directly and everything is going to be OK.
We are SO thankful to be at Stayton Acres and learning a lot about how to survive in this beautiful bread box we call HOME now. Previous Previous post: 10-4 Loud And Clear. 10-10. Next Next post: How Many Pairs Of Underwear? Wow, glad you are getting some time to work out the bugs.